Today I learned that Chris Brown, the City Library's patent librarian is to retire. Chris has done much for inventors and entrepreneurs in the North. She is a very skillful business and patents researcher. 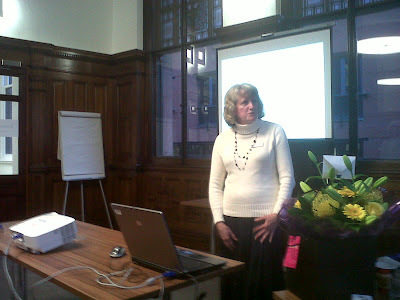 She runs the Manchester IP clinics. 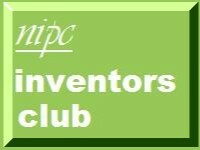 She is treasurer of the Manchester Inventors Group. I should like to add my thanks to those of many others for all her help over the years and wish her a long and happy retirement. At the end of their meeting this evening the members of Group gave Chris a little present. This photo shows Chris making her acceptance speech. Now losing Chris is bad enough but worse is that she is not to be replaced. The City will try to make do with non-specialist librarians. Now those librarians are no doubt very capable and dedicated professionals but they cannot be expected to find their way round esp@cenet or understand the results in the way that Chris can. Having been born at Lorna Lodge in Barlow Moor Road I can proudly claim to be a Mancunienne. For most of my career I have practised from chambers in Manchester and have thus contributed to the City's coffers. As much of the Council's expenditure over the years has struck me as utterly profligate I am all for making savings. But not replacing Chris is a false economy. Other cities are actually expanding their business and patents information services to fill the gap left by Business Link (see "Mark Prisk announces new business Advisory service" 8 Sep 2010 RealBusiness). I hope that the Council thinks again for the sake of the City and, indeed, country. I have a question about obtaining a patent? I wouldn;t have a clue how to go about it? Is there anyone out there that could offer some advice regarding this matter?